First, note that the relative magnitude of the partial regression coefficient of an independent variable is’, in general, different from that of its bivariate regression coefficient. In other words, the partial regression coefficient, bl, will be different from the regression coefficient, b,obtained by regressing Yon only XI’ This happens because XI and X2 are usually correlated. In bivariate regression, X2 was not considered, and any variation in Y that was shared by XI and X2 was attributed to XI’ However, in the case of multiple independent variables, this is no longer true. Conceptually, the relationship between the bivariate; regression coefficient and the partial regression coefficient can be illustrated as. follows. Suppose one were to remove the effect of X2 from XI’ This could be done by running a regression of XI on X2 In other words, one would estimate the equation XI = a + bX2 and calculate the residual X; = (XI – XI)’ The partial regression coefficient, bl, is then equal to the bivariate regression coefficient, b,. obtained from the equation Y = a + b, Xr• In other words, the partial regression coefficient, bl, is equal to the regression coefficient, b,. between Y and the residuals of XI from which the effect of X2 has .been removed. The partial coefficient, b2, can also be interpreted along similar lines. The intercept and the partial regression coefficients are estimated by solving a system of simultaneous equations derived by differentiating and equating the partial derivatives to O. Because these coefficients are automatically estimated by the various computer programs, we will not present the details. Yet it is worth noting that the equations cannot be solved if (I) the sample size, n, is smaller than or equal to the number of independent variables, k; or (2) one independent variable is-perfectly correlated with another. The strength of association is measured by the square of the multiple correlation coefficient, R2, which is also called the coefficient of multiple determination. A residual is the difference between the observed value of Yi and the value predicted by the regression equation. Yi. 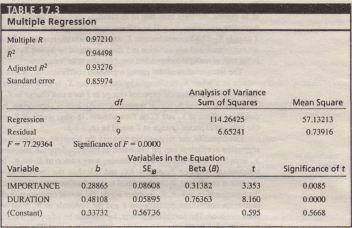 Residuals are used in the calculation of several statistics associated with regression. In addition, scattergrams of the residuals, in which the residuals are plotted against the predicted values, Y;. time, or predictor variables, provide useful insights in examining the appropriateness of the underlying assumptions and regression model fitted.’? The assumption of a normally distributed error term can be examined by constructing a histogram of the standardized residuals. A visual check reveals whether the distribution is normal. It is also useful to examine the normal probability plot of standardized residuals. The normal probability plot shows the observed standardized residuals compared to expected standardized residuals from a normal distribution. If the observed residuals are normally distributed, they will fall on the 45-degree line. 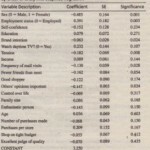 Also, look at the table of residual statistics and identify any standardized predicted values or standardized residuals that are more than plus or minus one and two standard deviations. These percentages can be compared with what would be expected under the normal distribution (68 percent and 95 percent, respectively). More formal assessment can be made by running the K-S one-sample test. Plotting the residuals against the independent variables provides evidence of the appropriateness or inappropriateness of using a linear model. Again, the plot should result in a random pattern. The residuals should fall randomly, with relatively equal distribution dispersion about O. They should not display any tendency to be either positive or negative. The plots and the residual table can be requested when the regression is run, for example, when using SPSS. You should conduct these analyses for multiple regression on the data of Table 17.1. From the histogram, it can be seen that five residuals are positive, whereas seven residuals are negative. By comparing the frequency distribution with the normal distribution that is plotted in the same output, you can see that the assumption of normality is probably not met but that the departure from normality might not be severe. Of course, one can do a more formal statistical test for normality if that is warranted. deviations. Furthermore, many of the residuals are relatively small, which means that most of the model predictions are quite good. The normal probability plot shows that the residuals are quite close to the 45-degree line shown in the graph. When you look at the plot of the standardized residuals against the standardized predicted values, no systematic pattern can be discerned in the spread of the residuals. Finally, the table of residual statistics indicates that all the standardized predicted values and all the standardized residuals are within plus or minus two standard deviations. Hence, we can conclude that multiple’ regression on the data of Table 17.1 does not appear to result in gross violations of the assumptions. This suggests that the relationship we are trying to predict is linear and that the error terms are more or less normally distributed.